A few updates condensed into one post. . . This experimental brew (recipe, update, and update) was bottled on Saturday, December 10. This gave the vanilla extract/pods around two weeks in the secondary fermenter – the chopped and scraped pods floated on the surface, and many of the tiny seeds were everywhere in the fermenter. Final gravity was 1.016, from a starting gravity of 1.056, giving 5.25% alcohol by volume. Final yield was just over 5 gallons of beer(! ), with 30 12-oz. bottles, 12 1-pt. bottles, and 4 22-oz. bottles. Four days after bottling, I was impatient and opened one of the small bottles. Carbonation was still very slight, but the flavor and aroma were delicious. A faint vanilla scent, but a rich vanilla flavor (not overpowering though, thankfully). I’m very excited to see how this is going to mature over the next few weeks! One week after brewing, I transferred my Fat Tire clone into the secondary fermenter. The aroma was very estery, with a strong banana component. I might have been a little worried, except the yeast strain is known to do this. The gravity was around 1.014 at this point, and hadn’t changed at all when I racked the beer into the bottling bucket today (December 17, 19 days after brewing). This gives 5% alcohol by volume, a little less than the 5.2% of real Fat Tire. From this batch, I got 20 12-oz. bottles, 14 1-pt. bottles, and 1 22-oz. bottle. Next time I might try scaling the recipe up a bit. When preparing to bottle, I’m very impressed by the absolute clarity of the beer. This bodes well for the final product (which I’ll probably test in a week’s time – Christmas Eve!). 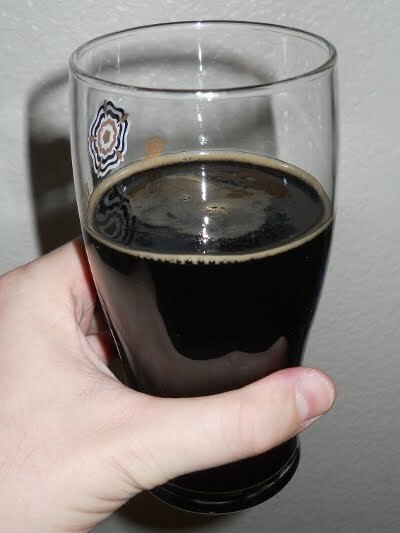 The Irish stout I made a few weeks ago has matured into a wonderfully drinkable brew. The head is a nice caramel-color, and isn’t overwhelming, but certainly sticks around the edges of the glass after pouring. The flavor has a hint of malt and is dominated by the roasted grains, and has a nice dry finish (as expected for the style). As I noted at the time of bottling, it’s not a very exciting beer (middle of the road flavor – good but no really unusual highlights), but it’s certainly a solid one. This kit was cheap, fast, easy, and tasty – perfect for the beginning or end of the brew season when I just want to crank something out! I’ll admit that it’s not quite as much fun as doing everything from scratch, but then again that’s also a welcome break sometimes. I expect I’ll probably do this kit (or a similar one) again! This entry was posted in amber ale, bottling, irish stout, vanilla porter and tagged Coopers Irish Stout, Fake Tire, Fat Tire, FTAA, Vanilla Voay Porter, VVP. Bookmark the permalink.